I'm a generic buyer. What else would you expect from a complete and utter tightarse like myself? So does it surprise you to know I use one of the more expensive dish washing tablets found on the supermarket shelf? It wasn't always the case though. I used to use generic branded powder, whatever cost the least. A few years back I was watching a friend stack her dishwasher after a hideously messy meal. Each plate was loaded with scraps of leftovers of saucy meat and creamy cheese stuck, remnants of our demolished lasagna that night. I was shocked to see her just stacking each plate without another glance. I would have rinsed every single plate thoroughly first, removing all food scraps. Otherwise, I would be pretty much guaranteed to be scraping off food and rewashing plates by hand afterwards, and since I hate washing dishes almost as much as I hate ironing, I would rather take the time to rinse when the food is still rinsable. I figured my friend was a dishwasher rookie, but she just laughed at me. Turns out, dish washing powder is one area that tightarsery does not pay. Her dishes all came out looking like an advertisement for Finish - sparkling and spotless. Without any of the rinsing effort I go to. This is last nights dinner - nice and messy spaghetti, with our bowls all goopy going straight into the dishwasher with no prerinse. As promised, everything comes out spotless once a Finish tablet goes in. 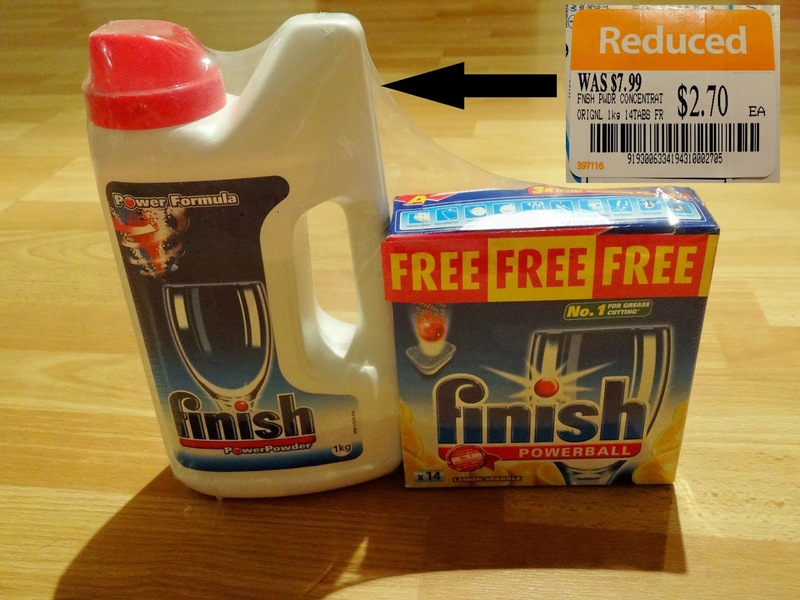 If you want to source your Finish products on the cheap, I find mine on sale through the various group purchase sites (Groupon, Scoopon, Living Social, etc), and occasionally pick it up cheap in the supermarkets. Watch the catalogues for sales. I picked up this pack this week on the clearance rack - x4 of them! $2.70 for almost $20 worth of product! Finish Quantum with New Power Gel - For an unbeatable shine! Just putting it out there that I would LOVE to try the Apple and Lime Blast - beyond disappointed that the sample I received was for Lemon, which has always been my go to in the past, but Apple and Lime sounds so much yummier. For more information head to www.finishinfo.com.au. The lovely people at Performics and Finish are giving you the chance to win a pack of the new Finish Quantum with Power Gel too! Easy entry below via rafflecopter. Apple and lime is really good!! I was trying to smell the new Apple and Lime ones at Coles the other day actually :) I'm sure they smell even better out of the packaging! Apple and lime sounds a little different to the usual lemon variety. Can't wait to try it out. Apple & Lime Blast, it sounds like an indulgent spa experience for my dishes. I generally choose lemon scented- nice and fresh, but would love to try the fresh scent. Apple and lime blast sounds like an interesting and innovative scent! Probably 'Fresh'.... the others might be nice but if the scent sticks around I'd get all weird about putting food on it lol. I'd love to try the apple and lime too - sounds nice and fresh! Apple & lime- sounds good enough to eat. Apple and lime scent. Smells delicious! I agree with you Apple and Lime sounds so much yummier. I buy lime dishwashing liquid and I love lime with my chicken. Apple and lime, my hisband loves apples, it might encourage him to do the dishes!! Apple and Lime Blast sounds dishwasher-divine! Apple and lime blast sounds very appropriate for summer! Apple & Lime Blast for Summer! Nothing smells as fresh and clean as LEMON SPARKLE! I love the Fresh Scent. Nothing is fresher than fresh! Apple and Lime Blast sounds like a nice summery scent. I've always been a Lemon person too, but I think I may just have to try the Apple and Lime. It sounds good enough to eat... off! Lemon Sparkle for sure, it's just so fresh!